In my first article (4-Aug-2016) I discussed about the introduction of TOFFEE-DataCenter. You can read the complete article HERE. And in my next update (13-Aug-2016) I showed the first TOFFEE-DataCenter GUI screenshots. You can read the complete article HERE. 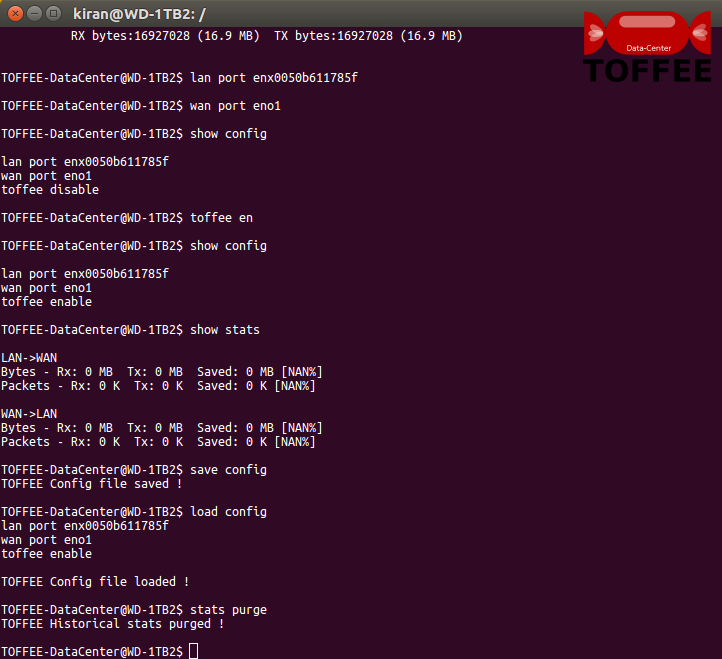 This is my next software development update of TOFFEE-DataCenter which I am working since past few weeks. 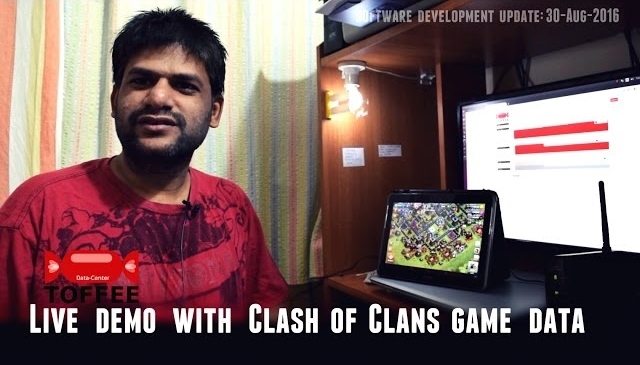 I was very busy in implementing the core TOFFEE-DataCenter components along with prototyping, benchmarking, implementing and testing the same. However today is the first time ever I did a fresh new CLI interface for the upcoming new TOFFEE-DataCenter. Unlike TOFFEE, TOFFEE-DataCenter is meant to be installed in servers with or without a GUI access (even a remote web-GUI) all the time. Whereas in TOFFEE the objective is to provide TOFFEE configuration interface always via easy to understand web user-GUI. TOFFEE needs web interface since it has similar user-case like any networking device (such as Wifi-Router, Router, Firewall or a manageable switch). But in the case of TOFFEE-DataCenter it represents a packet processing (or network) server. Hence TOFFEE-DataCenter mandatorily requires a quick, reliable, robust, light-weight and secure CLI access. 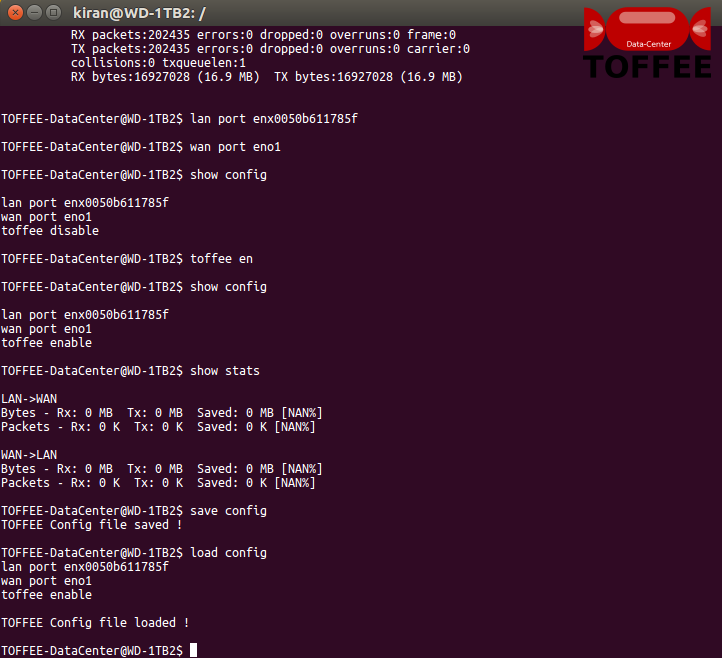 So here are my few screenshots of TOFFEE-DataCenter which I had supported so far today. The CLI underneath uses the GUI modules which makes it highly reliable with as much as code reuse(i.e TOFFEE-DataCenter GUI library). 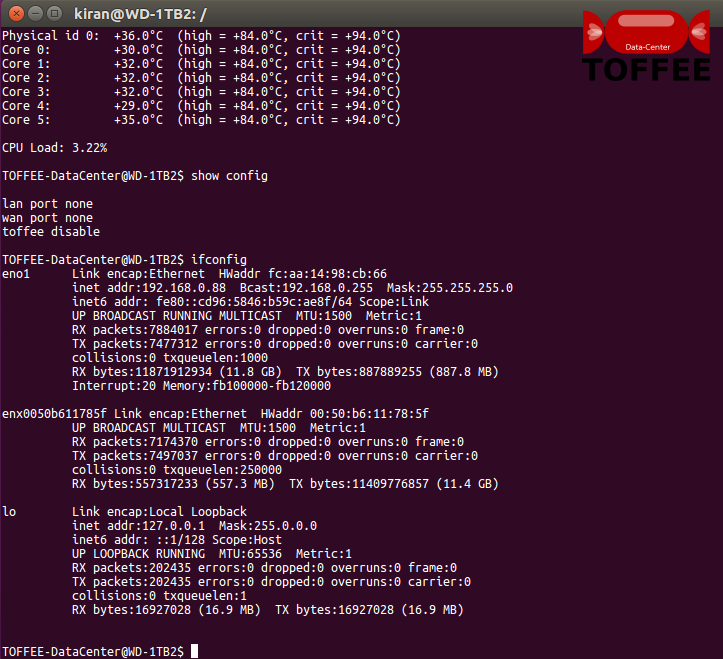 TOFFEE-DataCenter CLI access and greeting: An IT admin can access TOFFEE-DataCenter CLI remotely (via SSH) or directly (via Terminal) as shown. Upon access they are greeted with important system info parameters such as TOFFEE-DataCenter release version, release date, server's host name (hostname), server's booted kernel version (uname -r), CPU model info, CPU core count. This gives a sneak peak to the admin so that he/she can be aware always which system (TOFFEE-DataCenter server) they are currently accessing directly or remotely. At any time the admin can get host name info via their prompt. 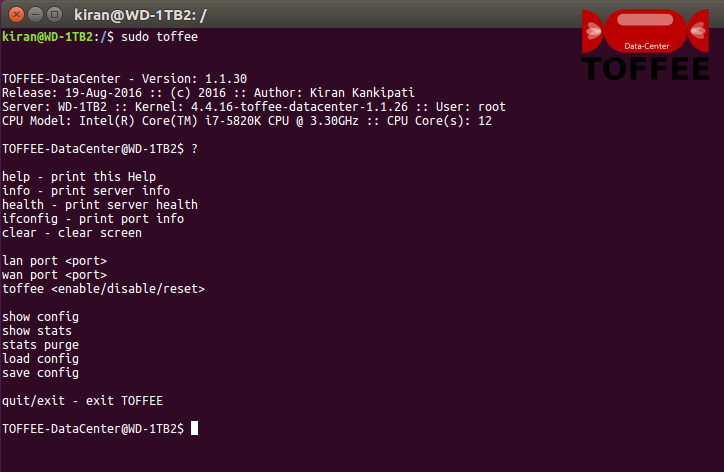 In this case it shows TOFFEE-DataCenter@WD-1TB2$ which stands for host name (or server) WD-1TB2. TOFFEE-DataCenter CLI :: Help: You can use shortcuts like "h" or "?" 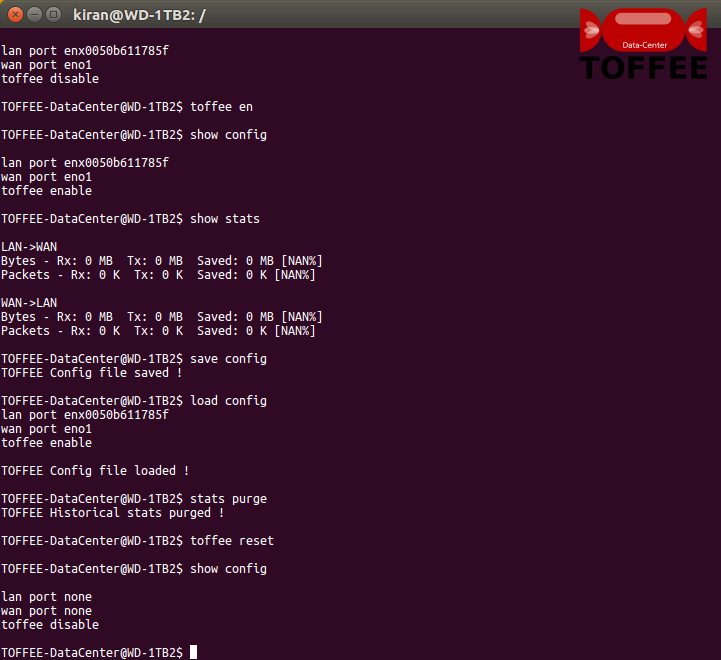 or "help"
TOFFEE-DataCenter CLI :: server info: shows the same welcome greeting with the system parameters. 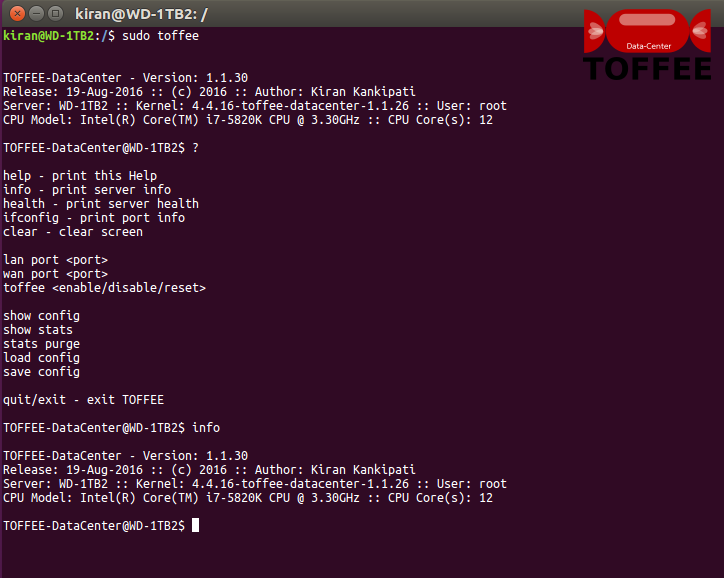 TOFFEE-DataCenter CLI :: server health: shows system temperature, CPU load, etc. TOFFEE-DataCenter CLI :: show config: This is the CLI equivalent of GUI big-picture interface. 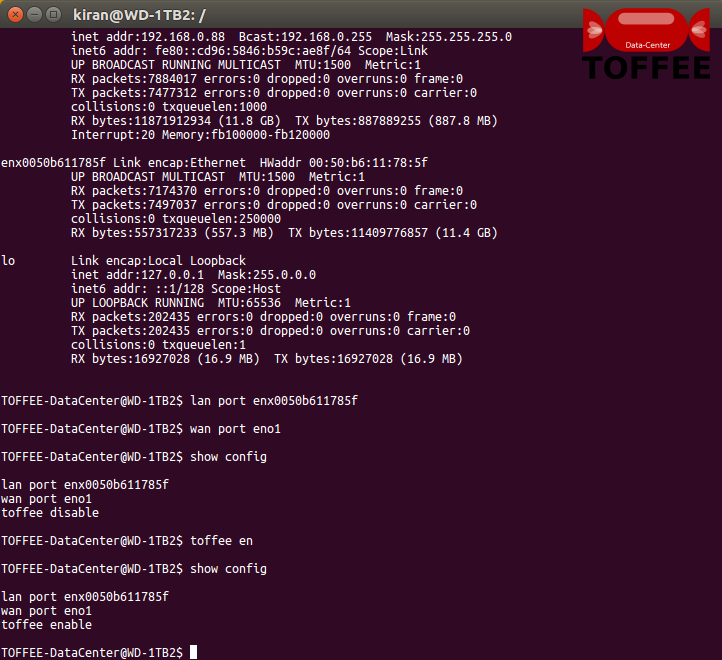 TOFFEE-DataCenter CLI :: set ports: set lan port and wan port. In future may support multi-lan and multi-wan ports. TOFFEE-DataCenter CLI :: show stats: It shows blank since the server/device which I am working is a development system. TOFFEE-DataCenter CLI :: save config - load config: You can save your CLI configuration in a config file and load when in need. Although this is optional since TOFFEE-DataCenter maintains the config in a database. But this config file acts as a quick user-profile specific TOFFEE-DataCenter server settings. TOFFEE-DataCenter CLI :: purge stats: Just like GUI you can purge historic stats. Sometimes it is needed for research and or debugging purposes. 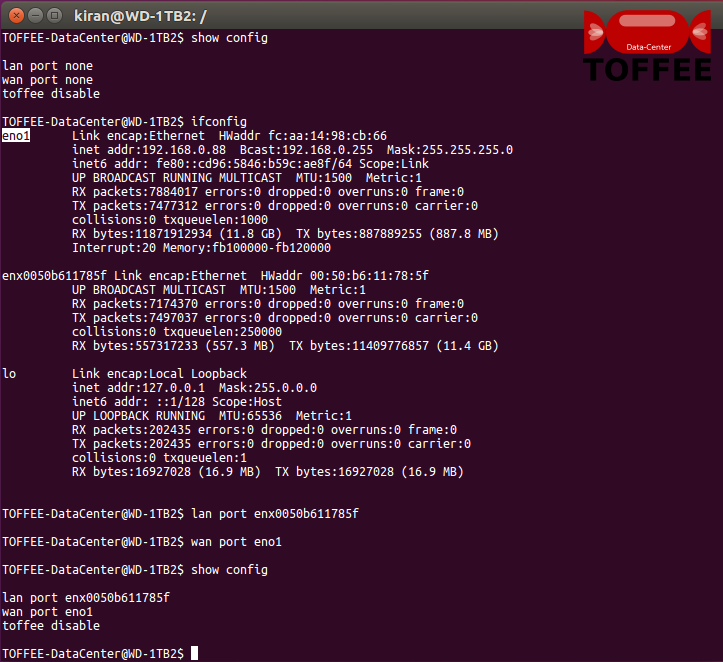 TOFFEE-DataCenter CLI :: TOFFEE reset: Do a TOFFEE reset. This resets ports and toffee forwarding bridge. This will not impact other settings. This feature may get well defined in future based on the way project progresses. TOFFEE-DataCenter CLI :: quit: Exit or Quit CLI. You can use short-cuts like "q" or "e" or "exit" or "quit" to quit the CLI. 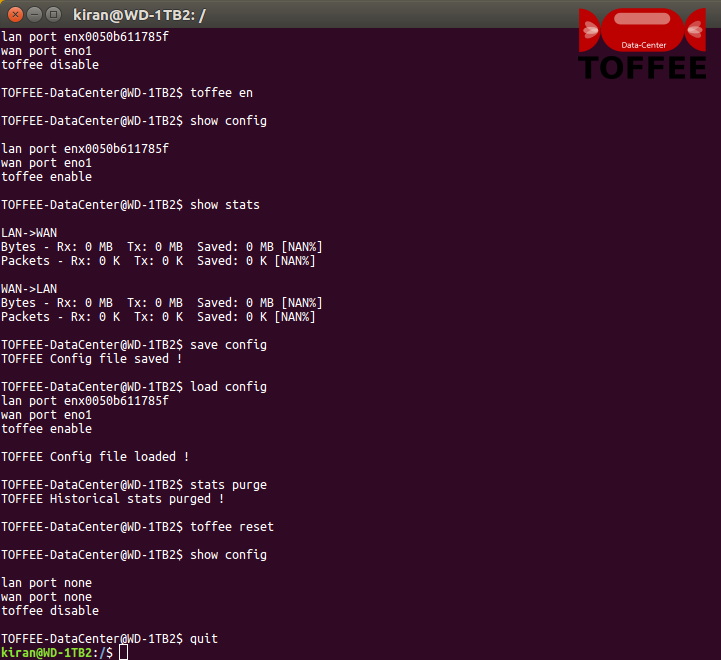 So this is the TOFFEE-DataCenter CLI interface so far supported. As one can understand it still misses many settings which are currently been supported in the TOFFEE-DataCenter web-GUI. I hope very soon sometime in future the CLI should get mature and will support all the configuration parameters of TOFFEE-DataCenter just like web-GUI. In my upcoming next update I may share more CLI screenshots with more commands (and features).